Just when you think scones can't get any better, along comes a new recipe which simply blows me away. Parmesan Buttermilk scones deliver everything you want from a scone, they are light, delightfully on the right side of crumbly and pack a lovely punch in flavor (thanks primarily to the cheese). This lovely recipe comes from food writer Jenny Lindford's book, The Creamery Kitchen. The recipe calls for homemade buttermilk as shown by Jenny in the book. Sift the flour, salt and baking powder into a large mixing bowl. Next, rub in the butter with your fingertips until it is absorbed into the mixture. Stir in the grated Parmesan and mix well. In a separate bowl, use a fork to lightly whisk together the egg and buttermilk. Now add it to the flour mixture and lightly fold it in to form a soft, sticky dough. Roll the dough out on a lightly floured work surface to 2.5 cm/1 in. thickness and use the cookie cutter to cut out 8 scones. Place the scones on the prepared baking sheet. 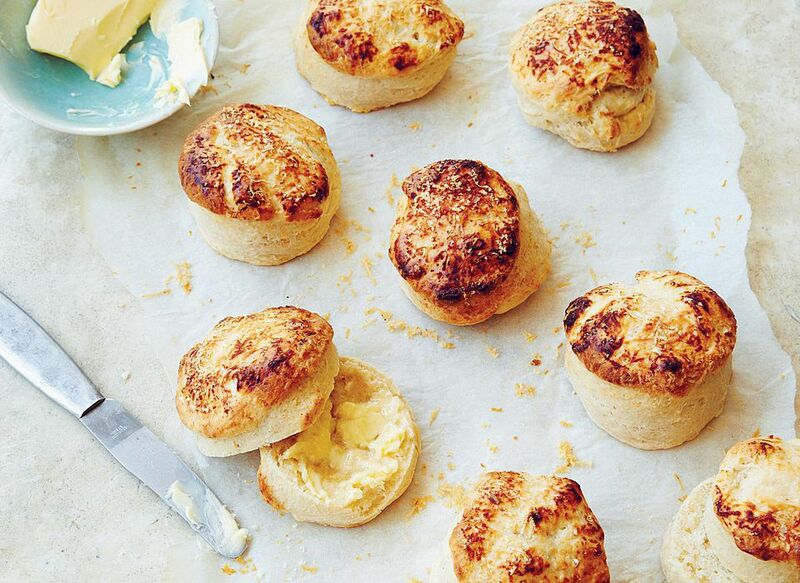 Brush each scone with a little buttermilk and sprinkle with a little grated Parmesan. Bake in the preheated oven for 10 to 15 minutes until they have risen and are golden brown. Here are a few hints and tips to ensure you make light, airy, well-risen scones. These are particularly good eaten warm from the oven, sliced in half with a little butter. When preparing the equipment and ingredients for making your scones, ensure they are all as cool as possible, including your hands. When cutting the scones using a tart cutter, avoid twisting the cutter, then gently shake the scone onto the prepared tray. Cook near the top of the oven, even when you are using a fan oven. Scones do like it best near the top.